How are these museum stanchions used to manage crowds, and highlight and protect merchandise all at once? These car show posts and belts for crowd control are designed with a lower profile to protect an exhibit of wares for sale or gallery artifacts without distorting views of the items displayed. Effectively engaging customers and visitors in displayed art or featured merchandise is easier with these auto exhibit display barriers. Each of these crowd partitions stands 2’ high, the perfect height for art exhibitions, theaters, conventions, and sales events like automobile expos. These museum stanchions with retractable belts eliminate “snap back” during setup, making it safe and easy to move the barriers around a room without injury. These car show posts and belts systems are perfect for designating a showcase area for a single item, or a larger grouping. Place a highlighted automobile or large-scale sculpture in the center of a showroom or gallery, and set up the queuing barriers along the space perimeter to keep visitors close to the display without making it vulnerable to damage. 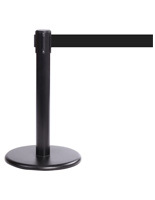 A collection of artifacts or sale items can be displayed and protected using these low profile museum stanchions, also known as car show posts and belts with slow-release and locking design. These crowd control systems create a secure display area in a showroom without obstructing views like taller models used for VIP queuing. 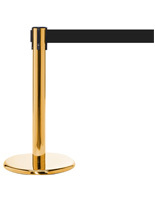 Each of these museum stanchions that are barriers with retractable belts measures 24” tall, keeping exhibited items protected and fully visible. What materials and features do these car show posts and belts have to make them effective exhibit tools for showroom and gallery? Museum stanchions in 2' heights are shorter than conventional systems to expand views of large merchandise like automobiles, or large-scale art and artifacts, when they are the focus of an expo or exhibit. Keep customers engaged visually by setting up a subtle queuing barricade that discourages handling without obstructing the view. Auto exhibit display barriers featured here have a sturdy but low profile cast iron base that keeps the barriers stable even during periods of heavy foot traffic. A stainless steel pole finished in polished brass, chrome, or black finish looks modern and professional in upscale environments. Rubber protectors prevent mars, skids, and dings on wooden, marble, or tile flooring when moving barriers around a retail showroom or gallery to preserve the fixtures and surrounding showcase space. This can be especially helpful in environments where exhibits are updated monthly, or new merchandise is added weekly. Top quality nylon retractable belts in classic black, blue, and red measure 2”w x 11’ long, and due to the slowly retracting strap design and lock they are safer to set up, with no “snap” that could hurt a staff member, visiting patron, or child. Retractable belting has a wider span, which means fewer posts will need to be purchased. Petite crowd control stanchions with retractable belts are meant to designate an area in which a collection of items being displayed, or a single exhibit of art, or an automobile can be showcased with maximum visibility. These museum barriers with a diminutive design are the most effective way to enhance a commercial expo while offering full visual access to wares with no physical interaction that could result in damage or tampering. The retractable VIP exhibit posts are placed around the perimeter of a retail showroom or art gallery to guide onlookers visually toward the display. 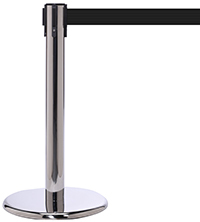 Buy these 24”h stanchions with retractable belts for an auto show or art exhibit and enjoy the all-purpose benefits of this quality line of crowd control supplies. Museum barrier posts are suitable in an array of retail and art environments to safe guard an exhibition from guests while still making them feel welcome. Restrict access to expensive merchandise with these shorter stanchions, and improve crowd flow at an art exhibit or retail showroom setting. In addition to offering all of these protective and directional functionalities, crowd control systems with short posts enhance the décor of any store or showroom, gallery or corporate hall with the beauty of brass, chrome, and black finish and eye-catching nylon black, red, and blue belts.